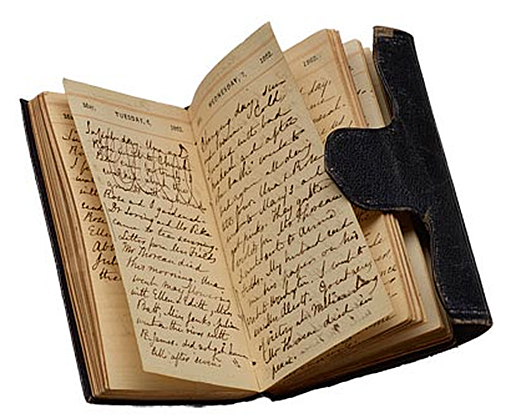 Diary of Sophia Peabody Hawthorne (1809–1871), 1862. This excerpt from Diary: A Novel by Chuck Palahniuk illustrates the actual meaning of karma. Instead of being a kind of cosmic retribution for people who don't believe in literal gods or eternal damnation, it's simply the reality that our character is represented through our actions. It's interesting to notice that the same rule is at work in fiction: action equals character. You're doomed to being you. This, he says, leaves us free to draw anything, since we're only drawing ourselves. Your handwriting. The way you walk. Which China pattern you choose. It's all giving you away. Everything you do shows your hand.